A wave of everything trendy is here. Catch the finest of lycra saris, asymmetric hems et al. These Are The New Trends To Try-On. Like Right Now! You’ll love ‘em! You’ll gasp when you’ll see these in your wardrobe. When they’re there, wearing a dull ensemble is out of question. Work or play, every event is going to be extraordinary. 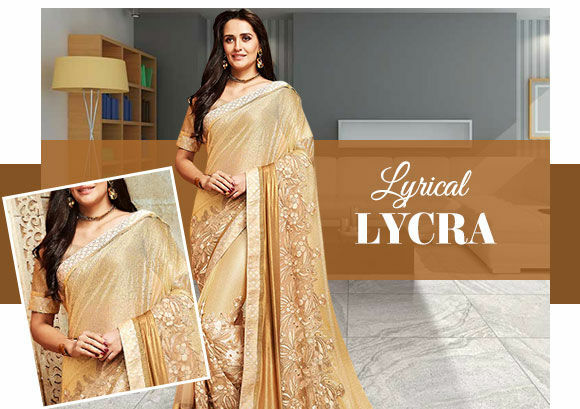 Scroll down to see what sort of shimmer lycra saris are trending this season or know the it-shades that have taken the world by storm. Also get to know the most magnificent silhouettes you feel the utmost confident in. 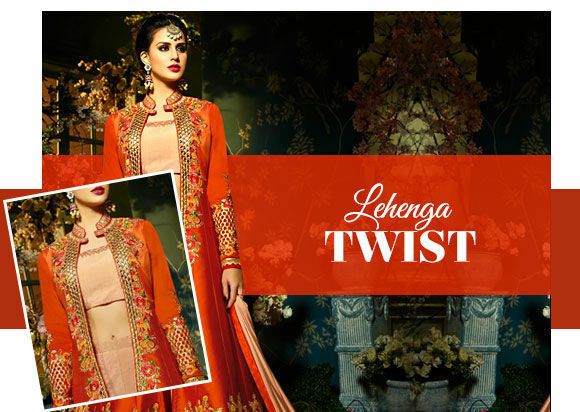 And for the grand occasions, dress your finest in striking Indian lehengas. Shop our style inspirations to embrace elegance over and over. When your party wardrobe is lacking oomph, it’s time to liven it up with shimmer. And that too with season’s trendiest of lycra sarees! Revered for easy fall and its gleaming appeal, lycra sarees are today’s most coveted drapes worthy of your attention. At UtsavFashion, choose from a plenty of designs, colors, and styles that are utterly flattering. Want to push the envelope with something unusual or say “extraordinary”? You’re definitely at the right place. 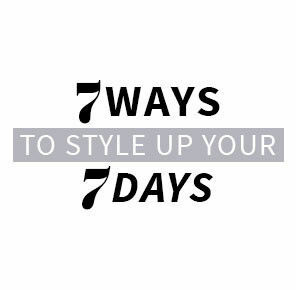 Because there’s no place on web where you can find such over-the-top styles to break the style rut! 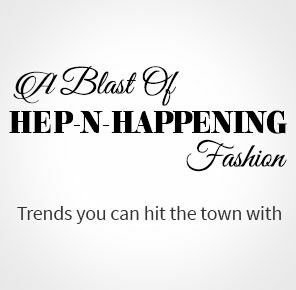 We’ve got an amazing range of capes and layers to redefine the look of attires you wanted to repeat. Then there’re striking silhouettes that include asymmetrical hems and front slits with eye-catching sleeves. 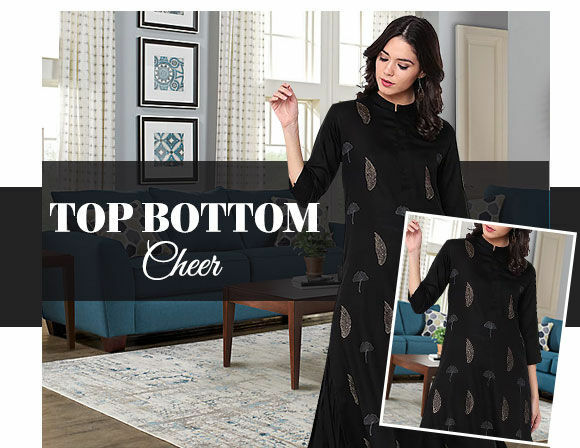 All come in form of mesmerizing blouses, Abaya style suits, and lehengas that truly strike the right chords. They say grey has power to impress. It’s slowly becoming staple color on Indian and international runway. 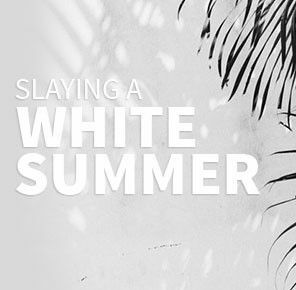 With its unbelievable quality of striking a balance between black’s asperity and white’s composure, grey is a must-have color in every woman’s wardrobe. A bonus point? Grey works well with an array of shades like neons and fuchsia. Red and green also compliment grey. You’ll love your decision of investing in grey chiffon sarees, Net Abayas, Silk Gowns, and or any other trending ethnic attire from India. A pretty dress can make your day! So make sure to gift yourself some. Wear them to fetch compliments that you never expected. Here we’ve a good number of stunning dresses with flowy cuts and patterns. They’re intricately detailed with placement embroidery. 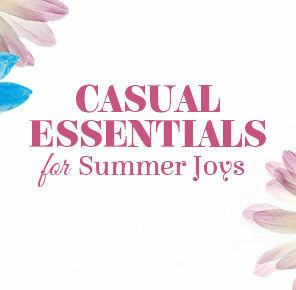 We’ve got a hundreds of colors from soft to bright hues. Go for neutrals, solid hues or whatever floats your boat. On some special occasions, it feels beautiful to go traditional! But when the traditional flavour is blended with a bit of fusion, you feel glorious! So to feel the glory, try our spectacular Indo western lehengas paired with an elaborately embellished Jacket Style cholis. 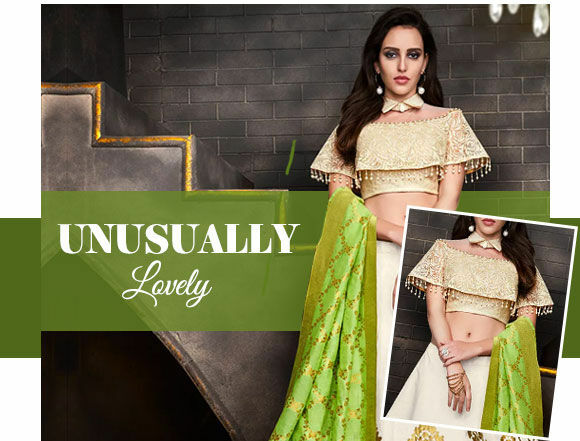 We’ve got a wonderful of fusion lehengas waiting for you to get explored. 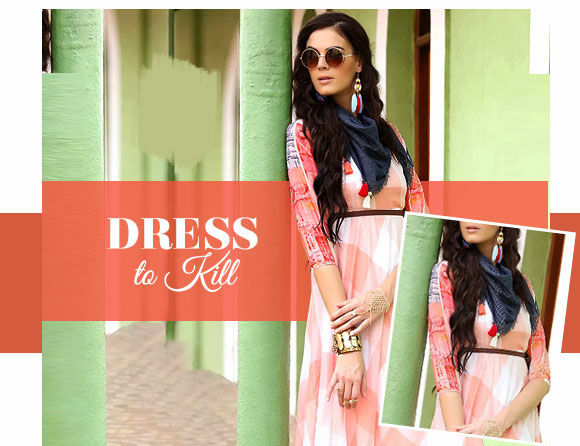 Ditch the dupatta and twirl it pretty! Fancying a sassy twist in your wardrobe? Give it in abundance with our sleek top bottom sets to everyday keep your look on-point. They’re the symbol of a great style sense. Let your crop top with skirt or a tunic with a palazzo do the talking.